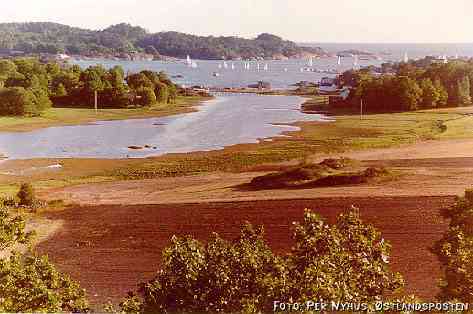 In the innermost reaches of Viksfjord in county of Vestfold is the trading centre of Kaupang. In the 800's this was Norway's largest trading town. It is quite possible that both the Gokstad ship and the Oseberg ship were built there and Harald Fairhair grew up in the area. 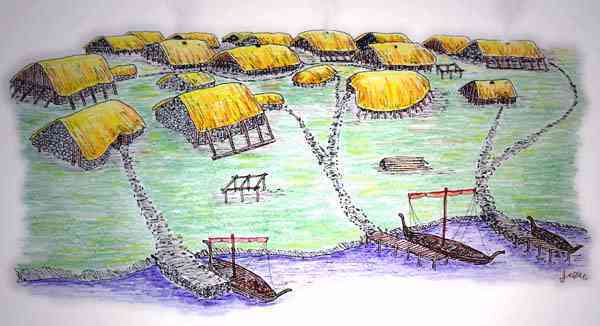 With its houses, workshops and burial sites Kaupang covered an area of about 50 decares (12.5 acres). Gravel roads led down to the stone piers where ships from the Arctic ocean and ships with goods from France, the Rhineland and Constantinople could be moored beside each other. Walrus-tusk ivory from the north for the royal courts of the continent and soapstone containers from Romerike on their way to wealthy households in Sweden and Denmark were two of the important exports of Kaupang. In the 900's the trading moved gradually to Toensberg farther north-east in Vestfold, and Kaupang slid into obscurity. Today there is no trace of the town left on the surface but underground, archaeologists have found remains of houses, shops, piers and various artefacts in the 3.5% of the area that has thus far been examined. The finds show that Kaupang together with Birka in Sweden and Hedeby in Denmark constituted an important link in the Viking era's trade network that as early as the 800's stretched from the Arctic ocean to the Mediterranean and from Constantinople to Dublin.